This article from the “Vanessa Runs Blog” is right on. Canola is bad oil, a bad fat. It's one of the worse things Whole Foods and other "health" stores continue to sell and they need to change. Look carefully at the labels of their prepared foods and you'll see canola used as the oil frequently. Olive oil comes from olives. Sesame seed oil comes from sesame seeds. But what is a canola? Canola is actually a made-up word for a genetically modified product. 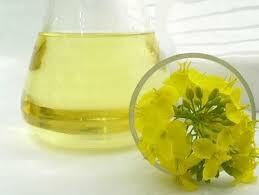 Canola oil is developed from the rapeseed plant, which is part of the mustard family of plants. These oils have long been used for industrial purposes (in candles, lipsticks, soaps, inks, lubricants, and befouls). It’s industrial oil, not a food. Rapeseed oil is the source behind mustard gas, and on its own, it causes emphysema, respiratory distress, anemia, constipation, irritability, and blindness. But through the beauty of genetic modification, we now sell it as edible oil. The claim is that canola is safe to use because through modification it is no longer rapeseed but “canola.” Except… canola is just genetically modified rapeseed. It has been marketed as wonder oil that is low in saturated fats with a beneficial omega-3 fatty acid profile. It is recognized by the American Dietetic Association and the American Heart Association based on the belief that the absence of saturated fats alone makes it healthy. From a nutritional perspective, canola oil has been found to deplete Vitamin E. It has a tendency to inhibit proper metabolism of foods and normal enzyme function. It also depresses the immune system. One of my listeners (Matilda) suggested an alternative to canola -- clarified butter. It is milk fat rendered from butter to separate the milk solids and water from the butterfat. Typically, it is produced by melting butter and allowing the different components to separate by density. The water evaporates, some solids float to the surface and are skimmed off, and the remainder of the milk solids sink to the bottom and are left behind when the butter fat (which would then be on top) is poured off. Ghee is oil with a long, fascinating history. Ghee has been a staple in Indian cooking for centuries. Besides being a practical way to preserve butter, Ghee was renowned for its medicinal and rejuvenates qualities. Ayurveda, the ancient natural healing system of India, regards Ghee as a vital food for healthy skin, mental clarity, and good digestion... a food for balancing all body types. Certified Organic Ghee (clarified butter) from grass fed , pastured cows is salt free, lactose and casein free, Kosher and has no GMO's (No Genetically Modified Organisms). 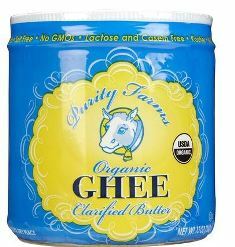 Ghee is made by Purity Farms www.purityfarms.com and can be found at many grocery and specialty stores. To discuss this newsletter or any other topic, tune in 8am -11am CST to the Dirt Doctor Radio Show. The phone number for the show1-866-444-3478. Listen on the internet or find a station in your area.